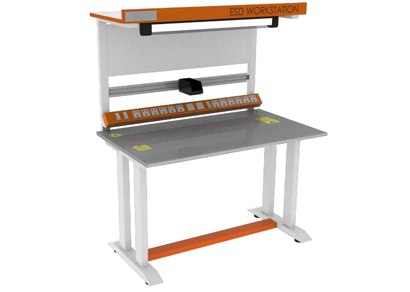 ESD table | Anti static Workstation | Apzem, India. Apzem Basic ESD workstation are ergonomically designed, simplest and most affordable ESD workstation for small to medium electronics Labs and Industries handling ESDS boards and components. Static charges generated by turbo charging or by friction on humans and other insulated materials should be properly dissipated before bringing in contact with sensitive Electronic components and circuits. Apzem basic series ESD workstation is designed with a aim to make low cost as well as ergonomic table providing completely ESD safe work environment boosting safety of ESDS components, Users and improves productivity. Construction:All our Basic series ESD workstation / Table are made of heavy gauge MS sheets and tube structures providing greater strength and longer life. Table Top : : Basic version comes with 19mm Thick post formed wood top with ESD mat glued over it. As an optional upgrade, we also provide 1 inch thick post formed ESD Laminated marine wood table top on request. Safety : :All wrist strap, ESD work surface are connected via 1 mega ohm resistor if its grounded through electrical power outlet grounding terminal, to safeguard user from shocks when ground becomes live accidentally. Storage: All Apzem ESD Workstation comes with standard three draw storage cabinet. Table top: ESD mat / ESD laminated table top.